Good News for Minority Students, University Grants Commission UGC invites the application for Maulana Azad National Fellowship for the year 2016 - 17. UGC will be the nodal agency for implementing the Fellowship.The Maulana Azad National Fellowship for Minority Students is formulated and funded by Ministry of Minority Affairs. 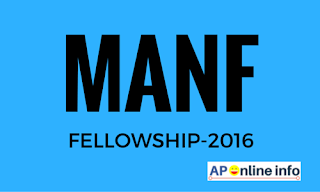 the Fellowship is to provide integrated five year fellowships in the form of financial assistance to students from minority communities, as notified by the Central Government to pursue higher studies such as M. Phil and Ph.D.degrees in Sciences, Humanities, Social Sciences and Engineering & Technology. 3% fellowships are reserved for Physically Handicapped candidates belonging to Minority Communities as per provision laid down by the Government of India. Candidate should belong to one of the minority communities. Candidate should be registered for regular and full time M.Phil/Ph.D courses in University/Academic Institution. The annual income of the beneficiary/parents or guardian of the beneficiary should not exceed Rs. 2.5 lakh from all sources. Transgender candidates are eligible to apply under the scheme. The reservation shall be followed as per Government of India norms. How to apply Maulana Azad National Fellowship ( MANF Scholarship ) online ? Interested and eligible candidates should be log on to UGC ( university Grants Commission ) official website http://www.ugc.ac.in/ , Than click on "Apply Now " fill the all necessary details on application form, Than Submit their application through online.Incomplete applications will not be placed before the Expert Committee. Candidates have to apply strictly as per instruction given in online application portal.